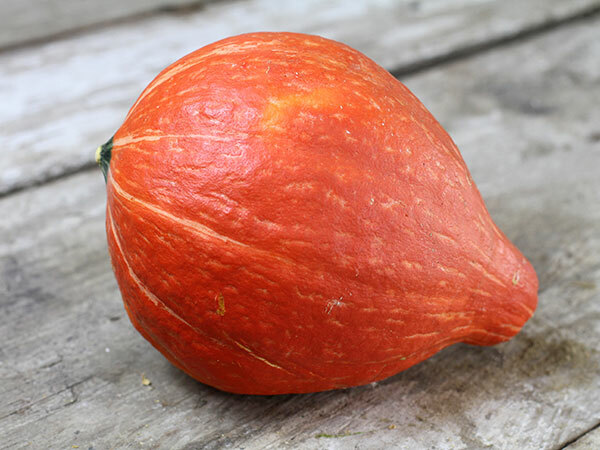 Red Kuri is a teardrop-shaped "baby red Hubbard" style fruit. They have a smooth-textured flesh. They are good for pies and purees because specks of skin (being red) will not show. 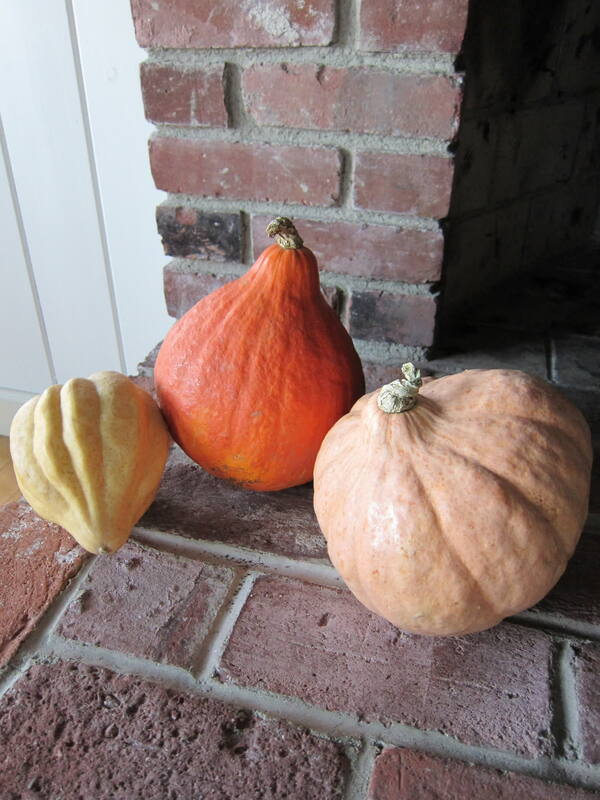 Also known as Baby Hubbard, Orange Hokkaido, Potimarron and Uchiki Kuri. 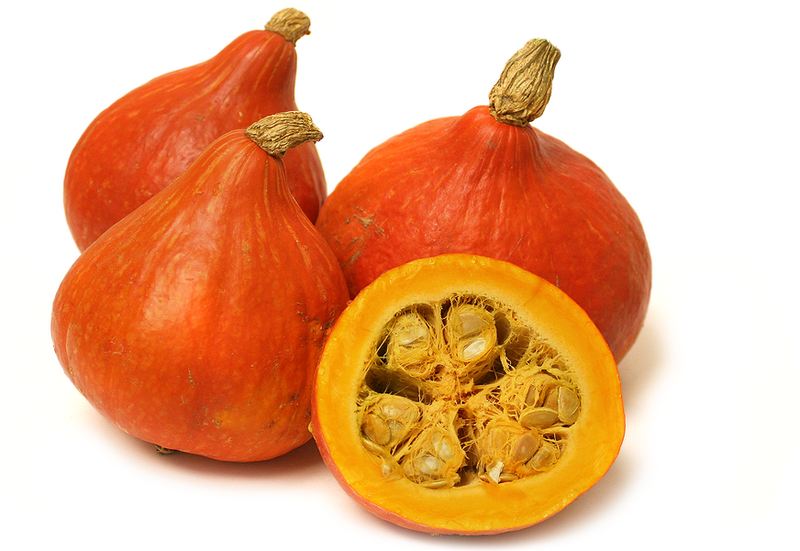 Raw or baked, this rich-flavored, fine-textured squash can be added to soups and stews, or eaten plain. It is in appearance similar to that of the classic hubbard only much smaller weighing on average only three to four pounds. The flesh is bright orange and has a mellow, somewhat nutty flavor. Culinary tip: Excellent in tempura, stir-fried or baked. Braise in dashi stock or coconut milk. 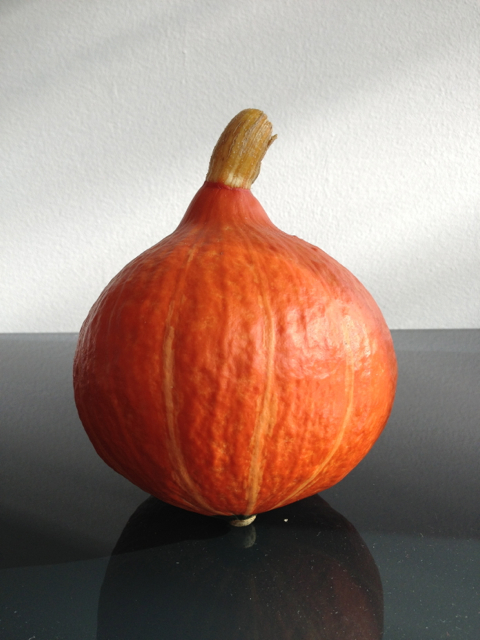 This year we only grew Orange Summer F1, an organic Uchiki Kuri type. 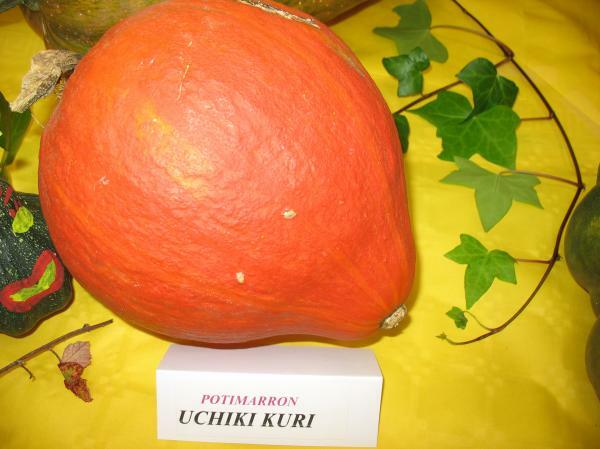 But two years ago we trialed it against the organic Uchiki Kuri (OP) that we carry. We found the Orange Summer to be more productive, much more uniform in size, and very comparable in flavor. It had a smoother texture. This year, when we tasted Orange Summer, we thought it had a good flavor, sweet but not too sweet. The defining words were 'balanced taste'. The flesh had a thick and creamy texture, and was very flavorful. 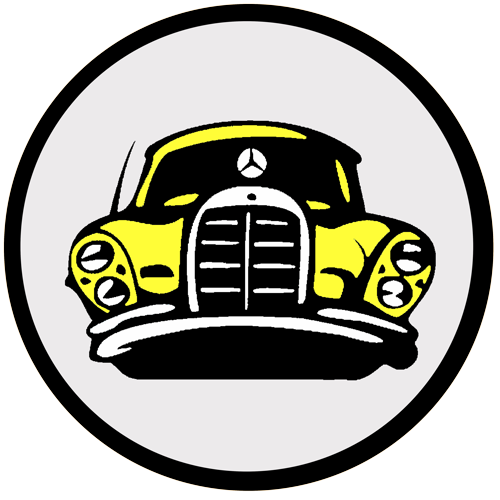 The interior color was a medium orange, with a slightly stringy appearance. There was lots of meat. 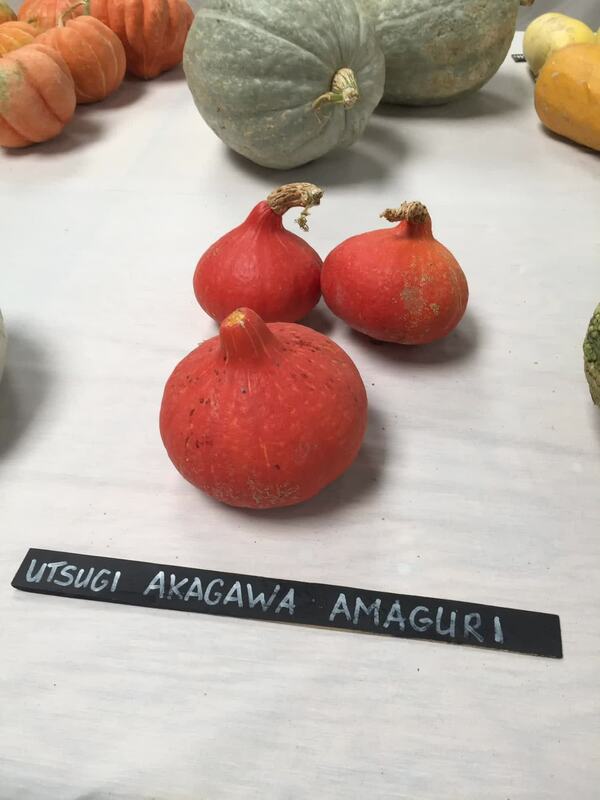 The exterior is a glowing orange, a little lighter than Uchiki Kuri, but with less of a light spot on the ground side of the fruit. 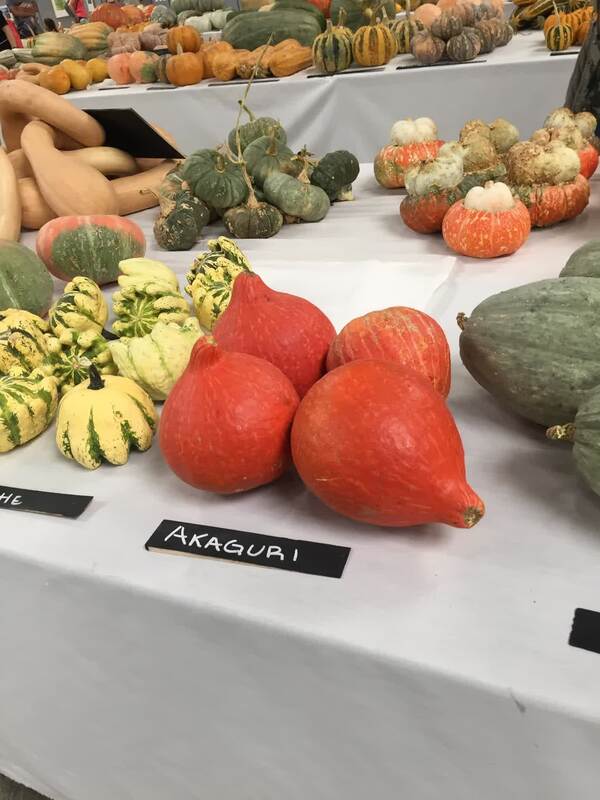 Red Kuri is also known as Climbing Onion squash, Hokkaido squash, Uchiki Kuri squash in its place of origin (Japan), and Potimarron squash in France. 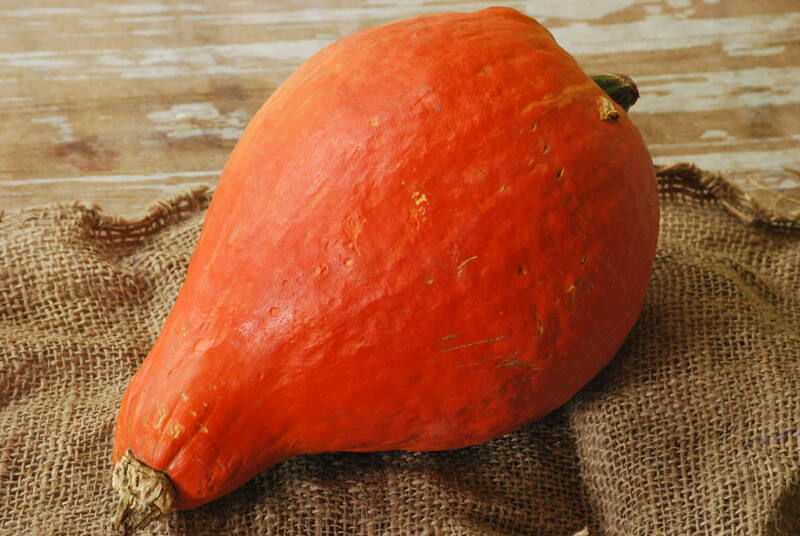 It is a hubbard type squash and sometimes also referred to as a baby red hubbard type since its appearance is like that of a petite hubbard. 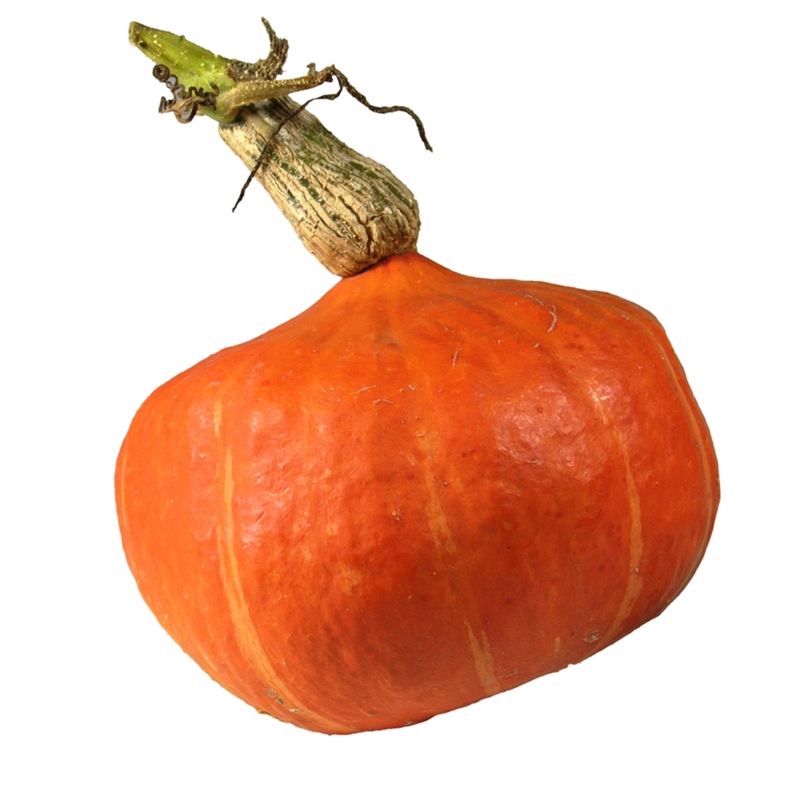 The word �kuri� translates to mean chestnut in Japanese, the main flavor profile found in the Red Kuri squash. 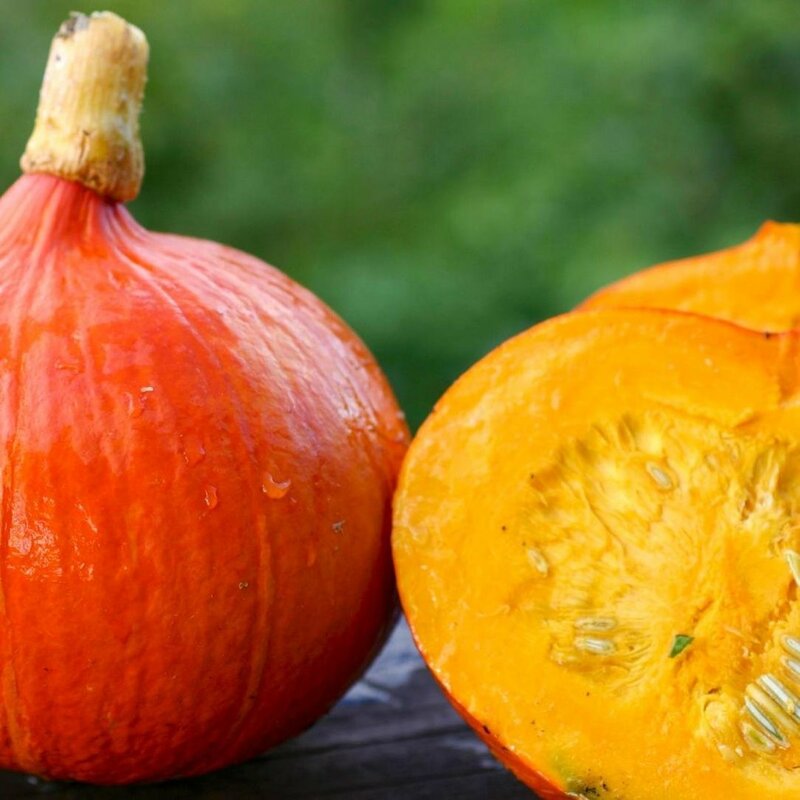 In France the Red Kuri is known as Potimarron which is a combination of the French words for pumpkin (potiron) and chestnut (marron), a nod to the squashes chestnut like flavor. In Germany the Red Kuri is known as Hokkaido, a name given after the Japanese island where the Kuri was first developed. 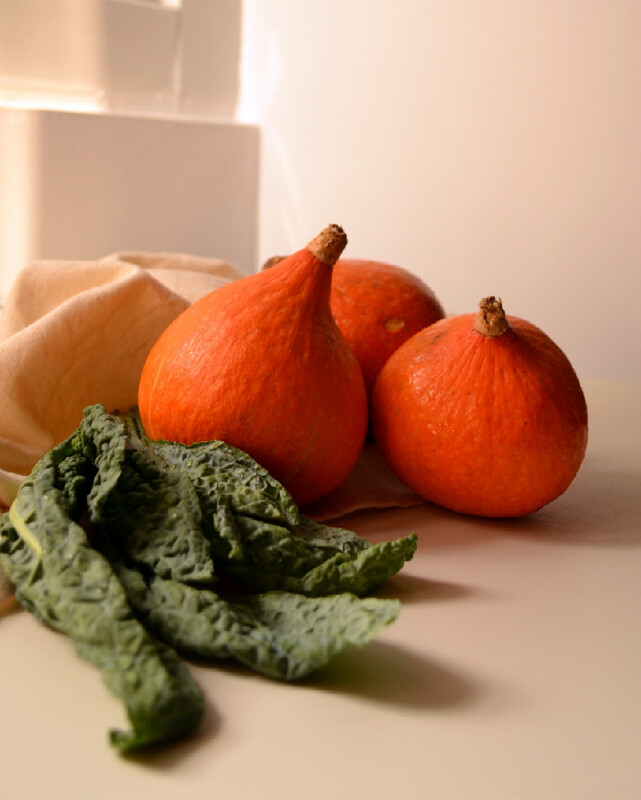 Prior to the arrival of the Red Kuri (Hokkaido) squash in Germany winter squash was relatively unknown in German cookery. 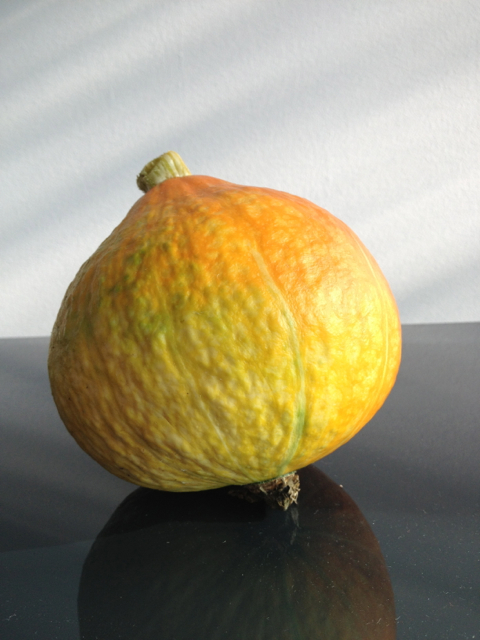 Since its introduction winter squash has become an important part of the culinary culture in Germany and has grown to include several American varieties as well, though the Hokkaido remains still today the most popular variety there. 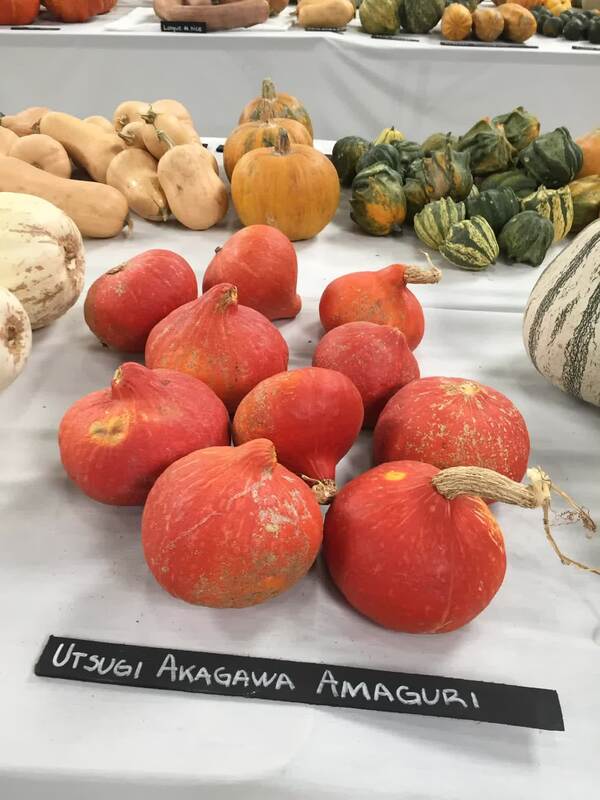 Red Kuri squash is native to Japan and was developed using a hubbard squash which was brought over to Japan in 1878, recently after Japan opened up to international trade. The Red Kuri was developed on the island of Hokkaido which bred the American hubbard to be smaller, thinner skinned, and to have a nuttier flavor. 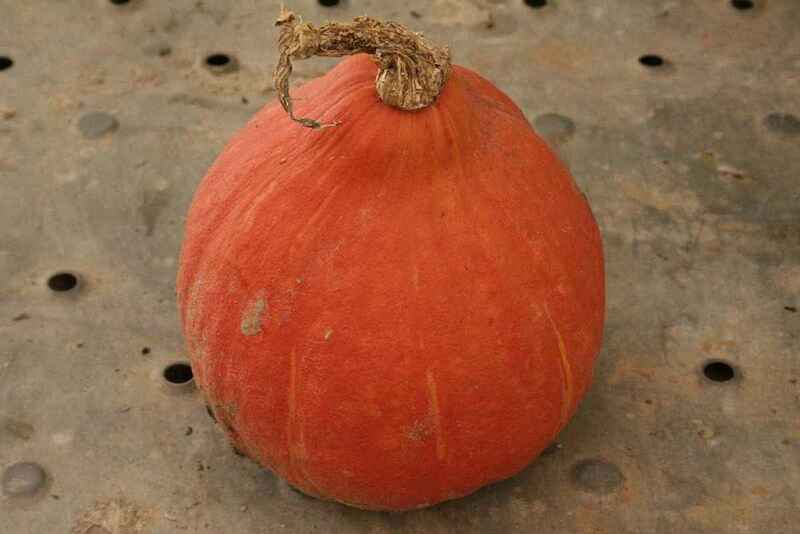 Today Red Kuri squash is popularly grown in Japan, Germany, France, Holland, England, and the United States. 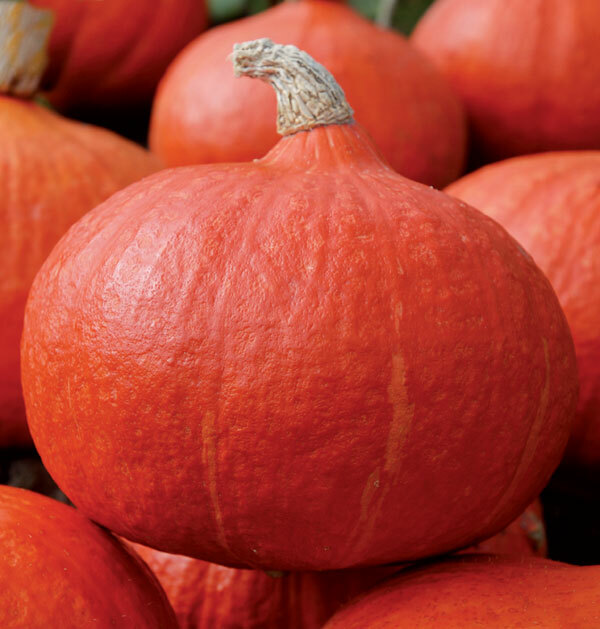 Red Kuri squash thrives and full sun and should not be planted outdoors until the risk of frost has passed for the season. 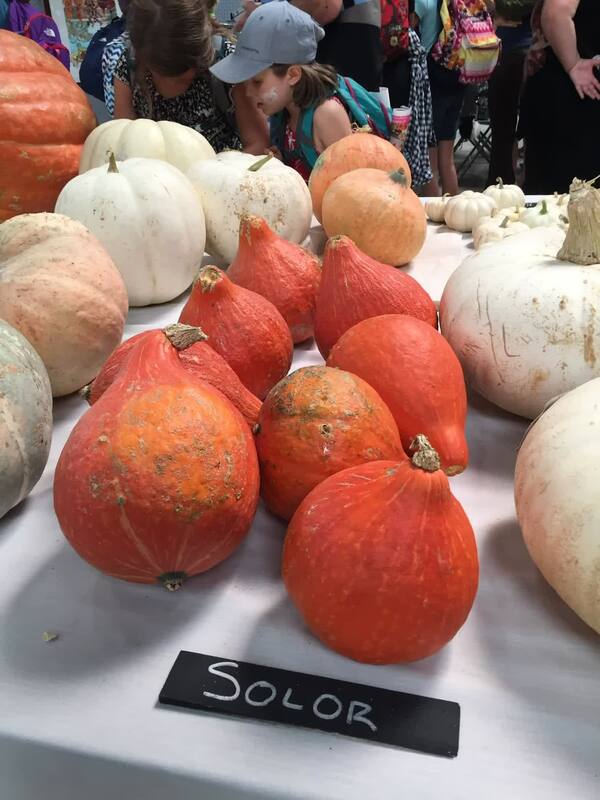 Squash are typically ready for harvest within ninety-two days of planting and can be cut from their vines with a knife. Be sure to leave at least two to three inches of stem on the squash as this will assure the squash has a long shelf life. 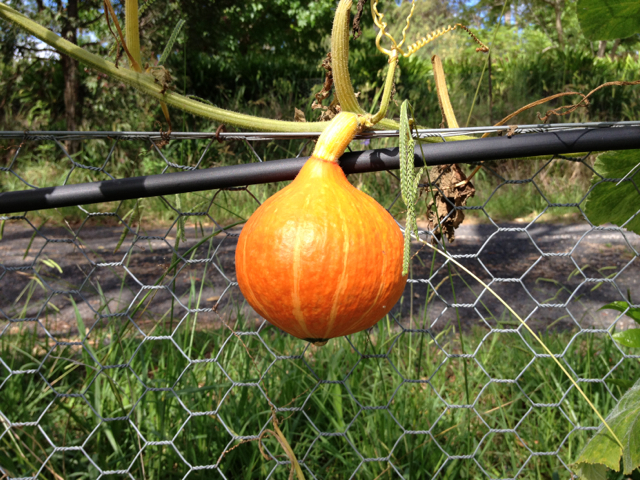 It grows best when left to ramble along a fence or raised structure. Weighs about 3 lbs when mature. 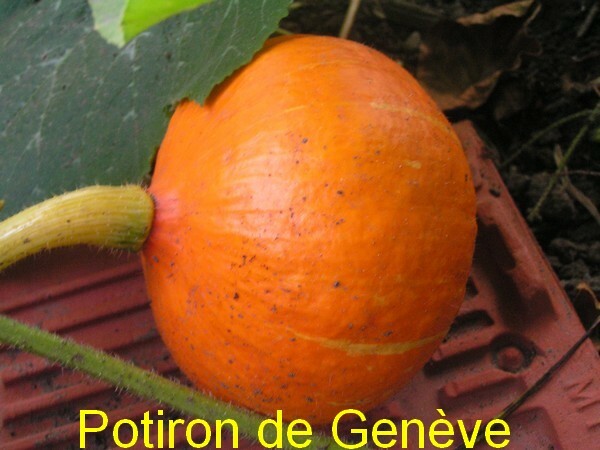 It is a variety of pumpkin producing small fruits of about 1 kg. 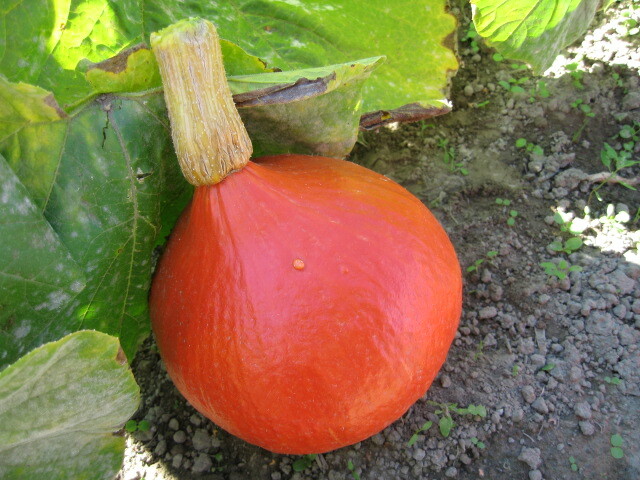 It is the earliest of all varieties of pumpkins. Solor is a variety derived from biodynamic research. She was selected by the seed company Bart Vosselman from De Bolster in Holland. Utsugi Akagawa chestnut in Japanese. Utsugi, a mountain in Japan.